I love the Panini titles but I was wondering whether the next couple of MWOM should have carried extra Avengers strips alongside Black Panther and Doctor Strange. 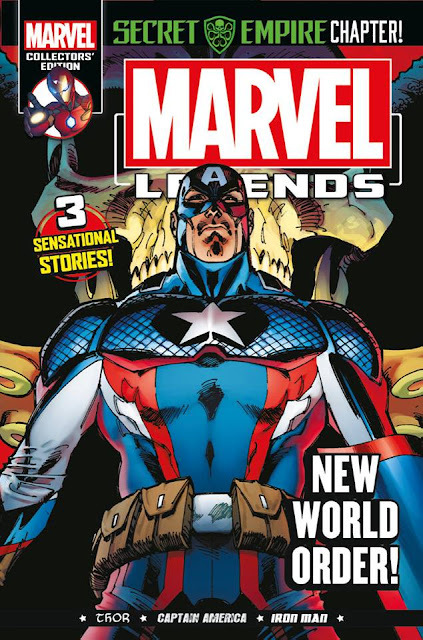 This is a big MCU month and as good as Secret Empire is within the pages of Avengers Universe, I’m not sure that it’s particularly accessible to the casual reader/consumer. I thought the same myself, Christopher. A missed opportunity not to put Thanos on the cover. I'm not a fan of the Champions at all (I'm too old for teen characters I guess) and they're on the cover again next month. I cannot get with Captain America turned into a Nazi (secret ROT-13 code message: vg vfag gur erny pncgnva nzrevpn), but as a plus, "Avengers Infinity War" has EVERYONE in it. Well - except for Silver Surfer, Iron Lass, The Champions, The X-Men, The Defenders...... pretty much NOT everyone. Panini also have the squarebound Thanos softcover one-shot racked alongside their usual titles so - maybe - they wanted readers to gravitate towards that rather than a cheaper option in the regular line-up. Yes, I saw that in Tesco the other day, although it had been placed alongside movie mags rather than with the comics. Still, it should reach the right audience. Good throwback to the early days of the Collectors Edition range which had trading cards given away free quite often up until about 1999. The next issue page of the latest Avengers shows "Free Trading Cards" again, wonder if they've gone a month early to tie in with Infinity War. On MWOM, I wonder if Panini totally underestimate how big a smash Black Panther would be at the box office and wishing they had kept the Panther on the cover for a few more months.The decision to reboot with Silver Surfer on the cover (as brilliant as that series is) whilst every other arc is partway through is probably one of the most baffling reboots Panini has done, and they are usually pretty logical. The issue with Black Panther on the cover sold lots of copies around here within the first two weeks. The one with the Surfer on is... not moving so quickly.